Shaun Lovejoy discusses fast winds, how to measure them, and who holds the record (there's a bit of a dispute). On a recent visit to the summit of Mt. 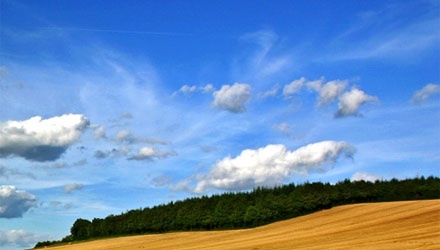 Washington (New Hampshire, USA), a sign proclaimed the “highest wind recorded by man”. This was surprising since more than two years had elapsed since a World Meteorological Organization (WMO) panel of experts announced that in Barrow Australia, Tropical Cyclone Olivia had “gusts” reaching 113.2 m/s thus largely surpassing Mt. Washington’s 103 m/s record (on January 22, 2010; see http://www.wmo.int/pages/mediacentre/infonotes/info_58_en.html). When asked about the sign, a sheepish employee explained that it was still the highest measured by man… I was reminded that the Barrow gust was recorded by an automated machine and went unnoticed for some time (the record gust was on April 10, 1996)! That face-saving answer avoided more interesting questions: if Barrow was such a clear winner, why was a committee needed – and did Barrow really win? The stories told so far describe how the champion was overlooked for nearly a decade and the work of the committee checking that the equipment was calibrated and properly functioning (http://blog.ametsoc.org/uncategorized/mt-washingtons-world-record-wind-toppled/). In other words, the problem had been reduced to comparing two speeds and deciding whether or not the numbers were reliable. Yet wind is turbulent, it constantly varies over huge ranges of scales – from milliseconds and millimetres on up: what is it’s speed? Indeed, when considering the highly intricate “Wierstrasse function-like” (i.e. fractal-like) structure of the wind, pioneer Lewis F. Richardson asked the question “does the wind possess a velocity?”, continuing: “this question, at first sight foolish, improves upon acquaintance” [Richardson, 1926]. For any site, a short burst of wind is far more likely to reach record speeds than longer averages. There is thus a clear dependence of both typical and extreme speeds on the resolution of the wind record. Unless this is taken into account, it’s the equivalent of a duel between lightweights and heavyweights. Conventionally the resolution issue is handled by recognizing a distinction between “sustained winds” and “gusts”. Both terms are fairly subjective: sometimes a “sustained” wind is defined as one that is exceeded for a certain duration, sometimes as an average (usually over one minute). When it comes to gusts, the US National Weather Service even gives two definitions: the traditional “gusts are reported when the peak wind speed reaches at least 16 knots and the variation in wind speed between the peaks and lulls is at least 9 knots. The duration of a gust is usually less than 20 seconds” as well as the one used by the WMO committee: a gust is a 3 second average. Since officially, the duration of a sustained wind can vary (from one minute for tropical cyclones up to ten minutes for determining Beaufort sea states), various rules of thumb have evolved. For example the US Navy gives a formula to translate from sustained winds at one minute to sustained winds at ten minutes (multiply by 0.88). This turns out to be close to the theoretical cascade prediction for the decadal scale change for wind statistics near the mean: 0.82 (using the empirical value of the exponent C1, see table 8.1 [Lovejoy and Schertzer, 2013]; note that this is not the correct formula for extremes!). From the cascade point of view, the resolution dependence is fundamental yet straightforward to understand and quantify. At a given space scale the variability depends directly on the ratio of the planet scale (where the cascade starts) to that of the measurement. Since the cascade builds up scale by scale, the wider the scale range, the higher the variability. When averaging in time, the relevant ratio is that of the lifetime of planetary structures (about 10 days, see [Lovejoy and Schertzer, 2013], ch. 8) to the measurement resolution scale. Since the measurement scale depends on the observer – the appropriate measure of the wind is a resolution invariant wind “singularity” which allows winds at different scales to be objectively compared. So what about the Mt. Washington – Barrow contest? According to [Pagluica, 1934]), the 1934 measurement was of an average wind of 231 miles per hour over a distance of 0.3 miles. This translates into 103 m/s over a period of 4.7 s i.e. with respect to the Barrow record, it is a “long gust” with a duration 57% longer than the official 3s. Converting the speeds into singularities (g), we find for the 3s Barrow gust g = 0.449 which is very slightly above the Mt. Washington 4.7s gust value (g = 0.445). However, both the Mt. Washington and Barrow events contained measurements of sustained winds at other resolutions. For example, we are told that the Mt. Washington gust was embedded in a particularly windy hour whose mean was 69.3 m/s. During this hour, an extreme 5 minute average of 84.0 m/s was obtained as well as an extreme one minute average of 85.8 m/s and a 17 s average of 93.9 m/s. Similarly, the Barrow gust occurred within a 5 minute interval whose average wind speed was 48.8 m/s. For the 5 minute Barrow average we find the disappointing value g = 0.409 substantially below the corresponding Mt. Washington value g = 0.479. On this basis, Barrow does indeed get the gold in the gust championship, but Mt. Washington takes the title in the sustained wind championship (indeed, the one hour Mt. Washington value g = 0.510 is even more impressive)! But this still isn’t fair: whereas Mt. Washington has been recording winds since 1874, the Barrow records only go back to 1932. How can we compensate for the disadvantage of having a shorter record? For this, one needs not only to remove the resolution dependency from the speeds, but also from the probability distributions. This is done using codimensions. Converting probabilities to codimensions (fig. 8.9a, [Lovejoy and Schertzer, 2013]), we find that all these records are indeed close to what are expected; there is no clear deviation, no clear winner at all! 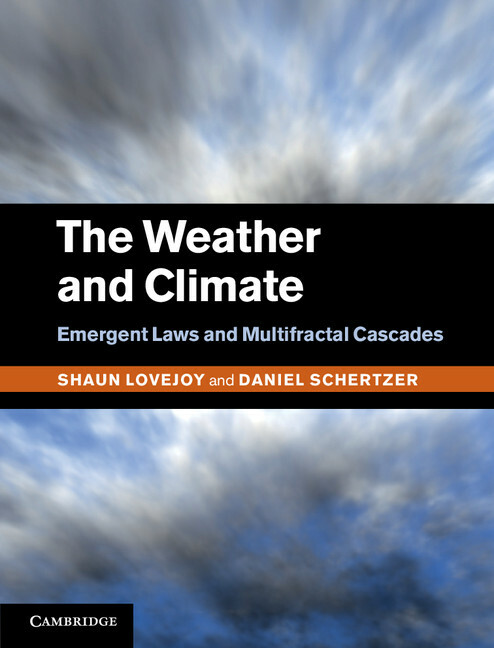 Lovejoy, S., and D. Schertzer (2013), The Weather and Climate: Emergent Laws and Multifractal Cascades, 496 pp., Cambridge University Press, Cambridge. Pagluica, S. (1934), The Great Wind Of April 11-12, 1934, On Mount Washington, N.H., And Its Measurement, Part I: Winds Of Superhurricane Force, And A Heated Anemometer For Their Measurement During Ice Forming Conditions, Mon. Wea. Review, 62, 186-189. Richardson, L. F. (1926), Atmospheric diffusion shown on a distance-neighbour graph, Proc. Roy. Soc., A110, 709-737.